Newsroom by the Bay’s residential students stay with program directors and team leaders in our Stanford dorm, and enjoy the award-winning Stanford Dining meal service. Our residential students come from all over the United States and overseas, but some northern California students also choose to stay as residents so that they can truly immerse themselves in journalism activities for a fun and intensive week. Here below are some frequently asked questions and answers about our residential program. If you don’t find the information you need here, please email us at newsroombythebay@gmail.com and we’ll be glad to help. Did you receive my payment? Is my residential space confirmed? We email “paid in full” invoices as soon as we receive your payment (credit card, PayPal or check). If you have paid and you have not received a “paid in full” invoice from us, please email us so that we can check on your account and make sure you do. Your space is not reserved until payment is complete. Our 2019 dorm assignment is in in the heart of the Stanford campus — Sally Ride dorm in the Stern Hall housing complex, across from Stanford Law School and an easy walk to the Tresidder Student Union, the Stanford Bookstore, “Mem Chu” (Memorial Church) and other campus landmarks, as well as beach volleyball and soccer fields. 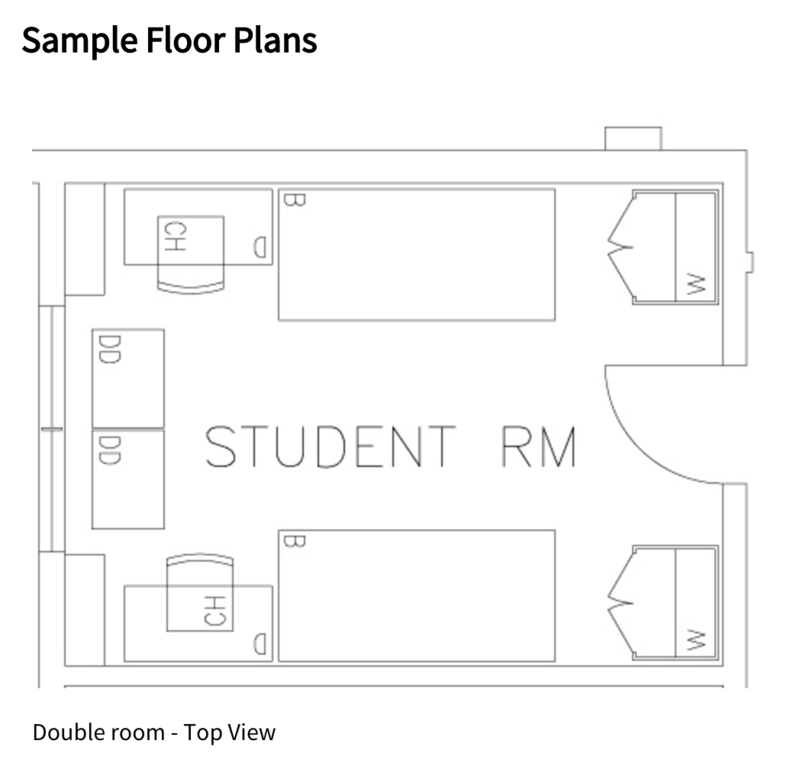 Typically our dorm includes doubles with a shared bathroom on each floor. Beds will be made with pillow, sheets and comforter; one bath towel, hand towel and washcloth is provided. We assign boys and girls to alternate floors. Students who are 18 years old as of camp time are housed in singles. If you/your student identifies as gender fluid, or has any other needs we should address, please let us know. When and where should I plan to arrive on Sunday? Please arrive at Sally Ride dorm between 1 p.m. and 3 p.m. on Sunday in order to check in and store luggage in our common room. Our program kickoff will begin promptly at 3 p.m. in the Ride courtyard. Students will not be checking into their rooms until 4:30 p.m. Parents are welcome to stay until 3 p.m. when our kickoff and teamwork begin. Click here for a map with interactive directions. Sally Ride dorm is located on Bowdoin Lane between Arguello Way and Galvez Street. You can get dropped off in front of our dorm, or you can park at nearby Wilbur Field Garage and walk west. Residential students who are unavoidably delayed and arrive after 3 p.m. should report to Ride and follow the signs to our common room, which will be clearly marked, and join our opening session in progress. Following the opening session, campers will have dinner and then meet with their news groups and team leaders. Yes! Parking is free for our Sunday drop off, Saturday multimedia show and Sunday pick up at Wilbur Field Garage on Wilbur Way at Campus Drive East. You can also drop off/pick up your residential or commuter students by parking directly in front of Sally Ride dorm on Bowdoin Lane. Please note: Bowdoin is a well-used traffic lane connecting the law school with the rest of campus so we want to be sure to keep it clear. Respect traffic in this area and use the garage unless your drop off/pick up is a short one. If you come to campus during the week and wish to park, the best options are parking at Wilbur Field Garage at Campus Drive East and Arguello Mall, or Tresidder Lot near Tresidder Union and the Faculty Club, off Mayfield Avenue. Both lots are $2/hour and parking is enforced from 8 a.m. to 4 p.m.. Pay by credit card at the parking machines located on the lot, or pay in advance by downloading the ParkMobile app. For more information about parking on campus, please consult Stanford’s Parking Enforcement guidelines and Parking and Circulation maps. How do I get from the airport to Stanford? Is there a shuttle available for students arriving from the U.S.? Due to family plans that are often subject to change, we do not provide shuttle service from the airport to Stanford for students who are coming to us from elsewhere in the U.S. If you need ground transportation from the airport to Stanford, we can direct you to SuperShuttle, which services San Francisco International Airport, and which will drop you off at our dorm. Many of our students have taken SuperShuttle to Stanford over the past few years with no problems. When making your reservation, have your flight information at hand, and please give our dorm address for your drop-off. Stanford is a big campus and it includes more than a dozen shuttle pickup/dropoff locations. SuperShuttle service to/from San Jose International Airport is limited so we recommend that you fly in/out of SFO if possible. Once you are at Stanford, we will arrange shuttles back to the airport for the students who need them. Please bring flight information with you so that we can do this. The cost of the return shuttles is $35 and you can pay by check or in cash. What if I’m arriving from overseas? Will you pick me up? Due to the length of travel, we do offer complimentary pickup to students who come to us from overseas. If you are one of our international students, please make sure to send us your arrival flight information as soon as possible so that we can make these arrangements with you. Your return to the airport also is complimentary. I need to/would like to arrive on Saturday? Can I do that? We can accommodate a limited number of students on Saturday prior to our program start on Sunday. If you require an early arrival, please contact us as soon as possible at newsroombythebay@gmail.com and let us know. The cost for early arrival, including a campus tour, tickets to the Saturday night soccer game at Stanford Stadium (with fireworks! ), dinner plus breakfast and lunch on Sunday, is $250. Where will I eat? What about my special dining needs (halal, vegan, lactose-intolerant, gluten-free, other)? Students and staff will eat at a spacious cafeteria that is adjacent to our dorm and is part of Stanford Dining’s award-winning food service. Expect several stations with a variety of American and ethnic cuisines (Asian, Mexican, Italian), plus a full salad bar and soft-serve ice cream. Students will not need money for meals unless they want to purchase snacks at Tresidder or a student coffeehouse; click here for a full list of campus eateries. If you/your student has special dining needs, please look in your registration packet for the Stanford Summer Conferences Special Dining Request, and send it back to us with your information so that we can inform Stanford in advance. There is no extra charge for this service or for special diets. At the Sunday check-in and orientation, all campers — both residential and commuter — will receive meal cards with access to Stanford Dining. Unless campers have made prior arrangements for early arrival (see above), the first meal is dinner on kickoff Sunday when our program begins and the final meal is breakfast on the final Sunday, departure day. Residential campers enjoy three meals a day. Commuters receive lunch every day plus a complimentary dinner on kickoff Sunday and on Saturday prior to the multimedia showcase. Will I have access to a washer/dryer? Yes — there are free facilities available in our dorm. Laundry detergent is available for purchase in the camp office. We also carry a supply of detergent in the camp office for emergency use. What tech tools should I bring (laptop, iPad or tablet, cellphone, digital phone)? While students may wish to bring some electronic devices, no tech tools are required — students who check the box on their applications indicating that they require an iPad will receive one to use for the week. However, many campers do bring digital cameras, videocameras, laptops and smartphones, and these are helpful. We work with students to get onto the Stanford wireless network when they arrive on campus, and we also recommend apps to students during their classes, most of which are free. Students should make sure they have the username/logins for all their devices so that they can access wifi and add apps. Will I have Internet access for my (laptop, tablet, smartphone)? Can I email? Students will have Internet access and email via their tech tools, such as computers or tablets. However, commuters must return all rented iPads to the camp office at the end of the day before they leave. There is no limit on the number of devices you can use on the Stanford wireless network. Are linens included in the residential program fee? Yes. Students will receive a bedspread, sheets, blanket, pillow and pillowcase, two towels and one washcloth. A small bar of soap, soap dish and paper cups also are provided. Common areas are cleaned daily, but there is no maid service for the rooms. Our dorm has a laundry room with washers/dryers, which students may use. What else should I bring to camp? Please see our suggested packing list below, which is in the registration packet that accepted students receive. If possible, you may wish to bring a small fan for your comfort while sleeping — we had rain and a heat wave last year, so it’s nice to be prepared. What time does the program begin and end every day? From Monday through Friday, breakfast is at 7 a.m., the morning chalk talk and afternoon reporting trip signup is at 8 a.m. and classes begin at 8:30 a.m. After lunch, there is afternoon reporting time on campus and in Palo Alto. Reporting time ends at 4 p.m. Unless students are on a field trip, there is downtime after 4 p.m. until dinner at 5:30 p.m. each day so that students can rest and/or exercise. Following dinner, we have guest speaker presentations or team circles from 7 p.m. to 8 p.m. Residential campers are required to attend the guest speaker presentations but they are optional for commuters. Team leaders are available for after-hours work until 9 p.m., or students can gather for movie nights. Lights out/bed check is at 11 p.m. Commuters must leave by the 11 p.m. bed check. Residential students may stay up past 11 p.m. but we recommend a good night’s rest to prepare for the day ahead. We release a day-by-day program schedule approximately one month before camp, not before, and only to accepted students. We appreciate your understanding as our goal is to create a program that is as current and cutting-edge as can be. My (friend, or relative, such as an uncle or aunt) lives nearby and would like to see me. May I leave the program for an afternoon or for a meal so I can see them? Yes, as long as you tell us about your plans in advance — we prefer at the very beginning of the program, but at least 24 hours in advance. We ask for advance notice because we plan carefully for your learning and your safety. If you plan to leave early, ask your parent/guardian to email newsroombythebay@gmail.com as early as possible before your planned absence; this should be an email from your parent/guardian and not from the friend or family member who wants to see you. Once we receive this notice, we’ll alert our team leaders to make sure you check in your equipment and are ready to be picked up. Obviously, time away from camp may mean a missed reporting opportunity or team time, but we understand and honor family connections. Some commuter families also request alternative pickup arrangements on field trip days so that you can head directly home after a trip to San Francisco or Silicon Valley. Again, for safety reasons, we discourage same-day requests for these alternative arrangements, but if you give us advance notice, we will do our best to accommodate your needs. When does the program end? When do I check out? Check out is from 8 a.m. to 10 a.m. on Sunday and our program ends promptly at 10 a.m. Unfortunately, Stanford rules and our own insurance policy prevents us from supervising or accommodating students on campus after this time. On Sunday morning, students will wake up at 7:00 a.m., eat breakfast, work with their team leaders to gather their belongings and clear their rooms, and then start saying their goodbyes (this can take awhile!). By 10 a.m., all students should be picked up by a parent/guardian, or be on their way to their airport of choice. Help — I can’t find my registration packet! Can I get another? When is it due? We send you your official “Getting Started” packet along with your first invoice, and then a link in April to our online registration packet. Please look for this email only after you/your student is accepted and we have received payment. You can complete this registration packet online, but you can also download, print and send us the forms by mail to Newsroom by the Bay, P.O. Box 20105, Stanford, CA 94305-9991. The deadline for registration packets is May 1. We will confirm all reg packets shortly after our May 1 deadline and contact you if yours is missing or incomplete. Your registration packet forms are very important to us; unfortunately, we cannot allow you to participate in the program as the signed forms are required by our insurer and by Stanford. Clothing (T-shirts, shorts are fine). Note: There are washers/dryers in the dorm. Cash and/or credit card for emergency expenses, such as health co-payments, or replacing lost keys (approximately $125) or meal cards ($15). Lost key/card charges are payable directly to Stanford; NBTB cannot pay for these costs. Cash/credit card for Stanford souvenirs and/or the occasional afternoon ice cream or frozen yogurt.